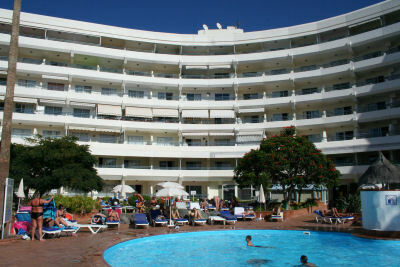 Santa Maria is a well maintained and popular complex, situated in the Torviscas area of Tenerife. The location is excellent as the beach is only 250 metres and there are restaurants, bars, shops and supermarkets in easy walking distance. There is a large freshwater swimming pool, which is heated during the Winter months and a separate childrens' pool. The surrounding sun terraces are spacious with ample sun loungers and parasols. There is a lift to all floors. This complex is a popular choice with couples and families. Excellent facilities. Car hire is not necessary at this property. There are laundry facilities in Santa Maria, pass reception and continue along to the hairdressers, down the steps and you will find the washing machine and tumble dryers, available for guests use (coin operated). Please also note that there is currently a restriction of hotel facilities at Santa Maria. Guests staying in privately owned apartments are not allowed to use all hotel facilities except the swimming pools and the loungers. However, they are free to consume their own food and drinks in the pool area. If they have children with them, they can join the kids club and all activities around the pool as normal. There is also an Irish bar on the lower ground which opens to the public in the evening. They provide drinks and light entertainment.